So first I told you a little about the history of Smarties. Then I shared with you my trip to the Smarties factory. And today I get to tell you all about the product line, and then give some away! As a Smarties Ambassador I got the most amazing package of assorted Smarties products delivered to the house. The boyz were in awe of all of the different items I kept pulling from the box. See for yourself! There were some of the tried and true favorites that we always pick up, the traditional Smarties Candy Rolls packaged in the iconic twists and well at the Smarties in a Pouch. But we were super excited to try some of the other items. 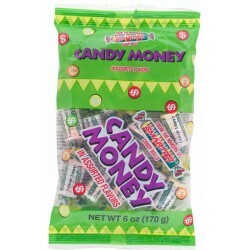 We loved the Smarties Candy Money. I had never seen that before! But all in all, my absolute favorite find was the Mega Smarties. They are HUGE and all of the things you love about the traditional Smarties in a MEGA size. Here they are in the palm of my hand! I’ve loved bringing you all things Smarties these past few weeks. I can’t wait to give away an assortment of Smarties candy to one lucky Momma D and Da Boyz reader. Just comment on this post with which type of Smarties you are looking forward to trying. This must be done first, or no other entries will count.Please be sure that your profile has your email right on it, or be sure to leave your email address in your comment. This contest is open to US residents only. 1. Like Smarties on Facebook and leave a comment back here for another entry. 2. Follow Smarties on Twitter and leave a comment back here for an additional entry. 3. Add our Facebook Page! Come back and comment here. 4. Follow me! If you become a follower of MommaDandDaBoyz, or already a follower, leave a comment for an additional entry. 5. Follow me on twitter and comment back here for another entry. 6. Tweet this giveaway on twitter. Comment here with a link to the tweet for an additional entry. You can do this once a day for the duration of the giveaway for added entries. 7. Blog about this giveaway! Comment here with a link to your blog entry for 2 additional entries. Be sure to label your comments #1 and #2. The Smarties Giveaway will end at 11:59 PM on September 12th. I would love to try the jumbo smarties. Love them. Thanks. I am so looking forward to trying the extrem sour smarties. I'd love to try the Mega Smarties. I follow Smarties on Twitter @mgoss123. I would like to try the Mega Smarties. I'd like to try the Smarties Candy Money. Thanks. Hello, MEGA SMARTIES! I so want to try these! 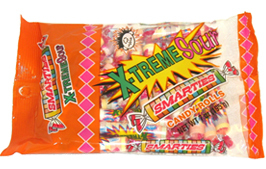 I would love to try xtreme sour smarties! I already follow smarties on twitter. I now like Smarties on Facebook. I'm following Smarties on Twitter. Following Momma D and Da Boyz on Facebook.